Delemma aims to inform, inspire, and encourage innovation in the fast evolving world of fashion, especially where it intersects with unique and pioneering technologies. Will Skinput technology Replace Clothing? Chris Harrison is a PhD student at a Carnegie Mellon University. Along with Microsoft researchers Dan Morris and Desney Tan he has devised a new technology called Skinput. “We strap iPods and other devices onto our arms. Why not utilise all the external surface area that is already with us?” says Harrison. He adds, “What’s great about skin, unlike tables, is that it travels with us”. Sounds like something out of a weird sci fi movie however this out-there technology is being taken very seriously by the big brass in various industries, including fashion. As cell phones and their respective keyboards continue to get smaller the relationship between specific keys and the average person’s fingertips becomes no longer efficient. The Microsoft/Carnegie Mellon research project titled ‘Skinput’ shows how our bodies can be turned into a touch screen interface by using sensor/motor trackers to sense the body part being activated. 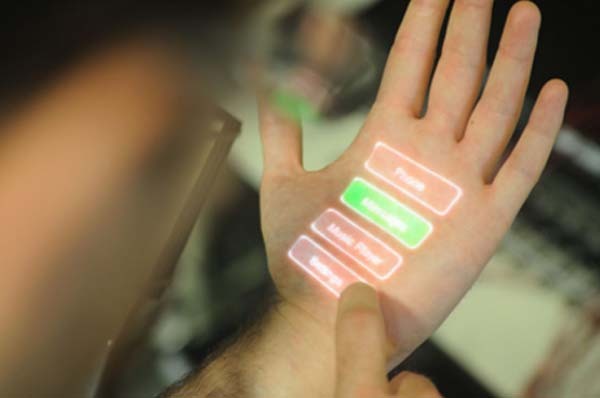 Basically, this technology turns you into a mobile touch interface. Skinput is pioneering approach which can listen to the vibrations and sensors to determine where the user activated the ‘tap’. It works by monitoring acoustic signals on your arm and translating these gestures and taps into input commands. Practically speaking , you wear a cuff (a bit like a blood pressure gauge) on your bicep which picks up your finger tapping on various parts of your arm and hands and interprets them as input signals to activate or inform the device it’s hooked up to. © 2019 Delemma All Rights Reserved.